The Hamden Arts, Recreation and Culture Department continues its Saturday Afternoon Entertainment Series with a show by “Matias the Magician” on February 6 at 1 pm. Matias Letelier, a magician from New York, has been designated “Best New Comedy Magician” for three consecutive years, and received a “Best of Manhattan Award” by the New York Press. He will provide lots of interactive fun with a unique blend of magic, clean comedy, high energy, music and a live bunny. Audiences are amazed over and over. The performance is at Thornton Wilder Hall, Miller Cultural Complex, 2901 Dixwell Avenue. Tickets at the door are $2 for children and $3 for adults. For more information call 203-287-2546. This is a great workshop for parents and four year olds that will be entering Kindergarten in the fall. 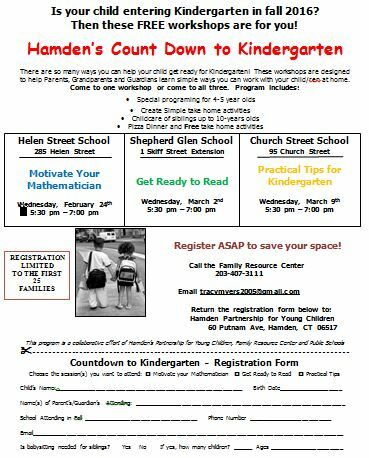 These series of three workshops are designed to help parents, grandparents and guardians learn simple ways to work with their child at home to help prepare them for Kindergarten. Families can come to one, two or all three sessions. The workshop includes dinner, programming for parents and 4 year olds and babysitting for siblings. It is a FREE program and the best part is each family will leave with books/activities/games to work with their child at home. February 6, 2016 - Magic Show 1 p.m.
February 27, 2016 - Wellness Fair 10 a.m.-1 p.m.
March 13, 2016 - Echoes of Sinatra 2 p.m.